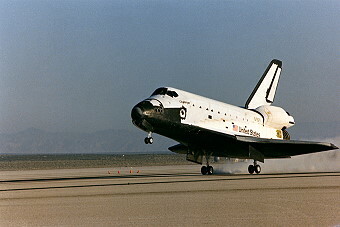 Launch from Cape Canaveral (KSC); landing on Edwards AFB, Runway 15. 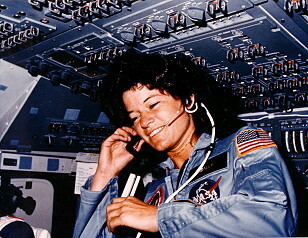 Sally Ride became first American woman to fly in space. 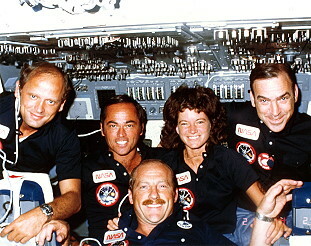 It was first mission with a crew of five persons. 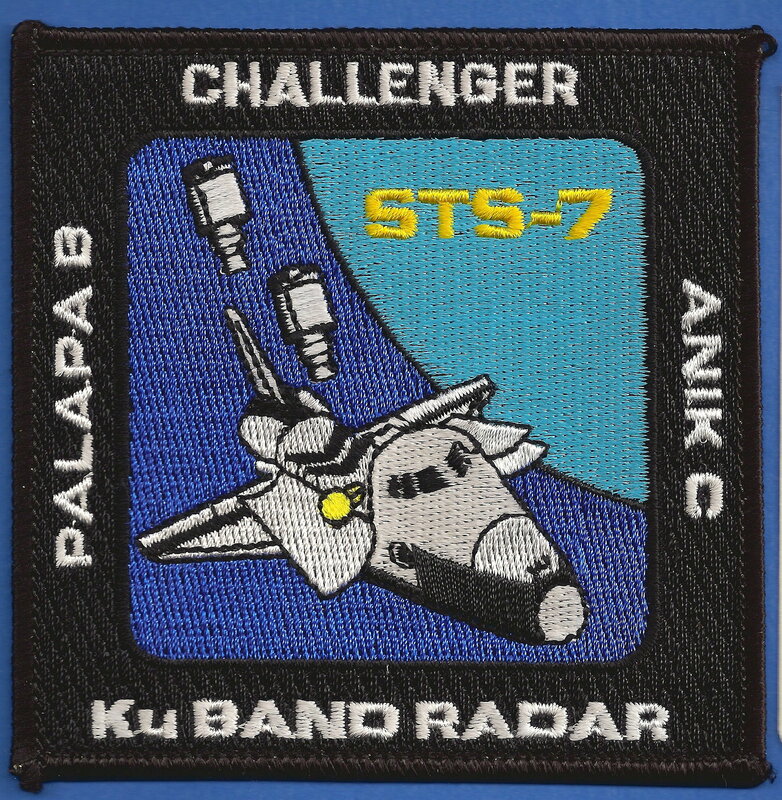 Successful deploying of communications satellites Anik C-2/Telesat-7 (Canada) and Palapa B-1 (Indonesia) on the first both flight days were performed. 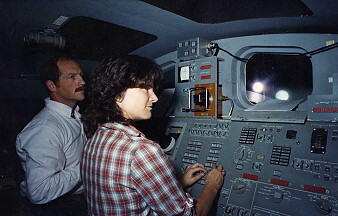 The Anik C and Palapa B spacecraft were both built by Hughes Aircraft Co., El Segundo, Calif., and are similar in design. 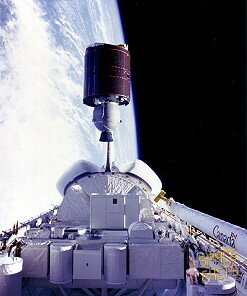 Anik C-2 is the second of three Anik C satellites that will eventually be put into operation. 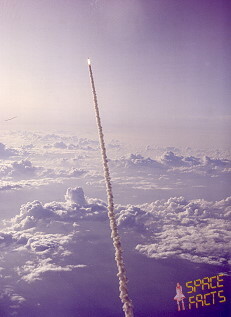 The first Anik C was placed into low earth orbit by Columbia on STS-5, in November 1982, the Shuttle's first operational mission. The Anik C spacecraft are Canada's first totally dedicated commercial satellites to use the 12/14 GHz band frequencies, allowing a 100 percent increase in telecommunications capacity of the first Anik satellite. 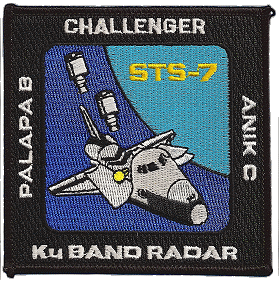 Palapa B is the second generation of satellites for Indonesia. Two of the communications satellites are being built for PERUMTEL, Indonesia's state owned telecommunications company.With its 24 transponders, Palapa B was able to deliver voice, video, telephone and high speed data services electronically linking Indonesia's many islands and bringing advanced telecommunications to the nation's 130 million inhabitants. Palapa operated at 108 degrees east longitude. The deployment sequence for both spacecraft will be nearly identical. 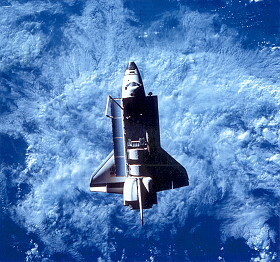 During the final pre-ejection sequence, the orbiter maneuvered into a deployment attitude with the open payload bay facing the direction desired for firing the PAM motor. A clamp was released by explosive bolts and a set of springs pops the spinning payload out of the bay at about .8 m (2.5 ft.) per second. 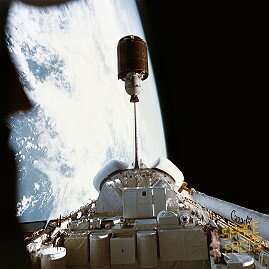 The Payload Assist Module was automatically set to fire its solid propellant motor 45 minutes after deployment. 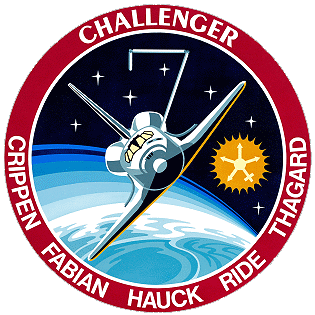 About 15 minutes after the spacecraft is ejected from the payload bay, the orbiter performed an evasive maneuver to make sure it is at least 14.8 to 18.5 km (8 to 10 miles) away from the satellite when the motor ignites. 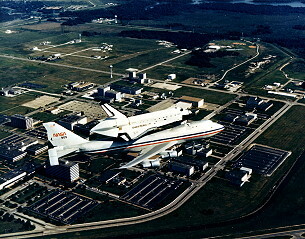 In this mission the first deployment and retrieval exercise with the Shuttle Pallet Satellite SPAS-01 (built by Messerschmitt-Bolkow-Blohm, a West German aerospace) including 10 experiments was done. 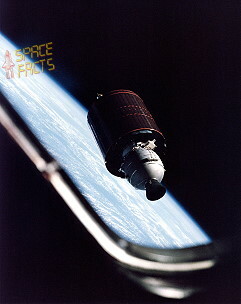 SPAS-1 was unique in that it was designed to operate in the payload bay or be deployed by the RMS as a free-flying satellite. 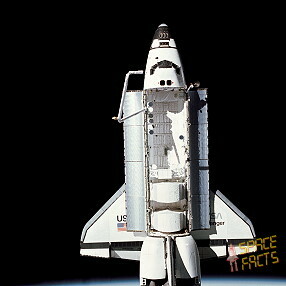 The SPAS-01 configuration, with experiments, was 4.8 m (15.7 ft.) across, 3.4 m (11 ft.) high and 1.5 m (4.9 ft.) wide and weigh 2,278 kg (5,022 lb.). Subsystems are of modular design, such as power supply, data processing and attitude stabilization, and it is equipped with interchangeable mounting panels for subsystems and experiments. The orbiter provides the power and data interfaces via hardware in the attached mode. 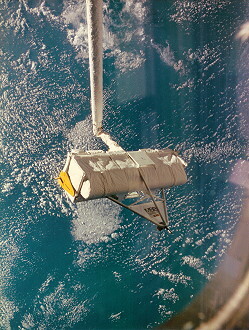 Communications with the SPAS in the free-flyer mode is by Reactor F. The pallet is non-active during ascent and descent. 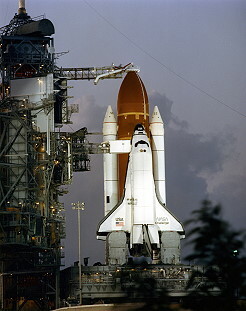 It has a 40-hour freeflying lifetime; 9.5 hours of that at full operational power. NASA has equipped the SPAS with a Hasselblad still camera, a 16 mm motion picture camera and a color/black and white video camera to record the deployment and retrieval operations. 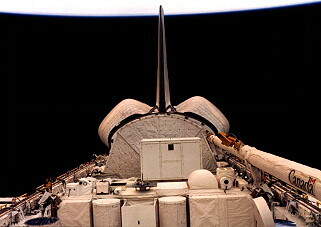 These cameras were enable NASA to record for the first time the operational capabilities of the orbiter from a platform outside the vehicle's cargo bay. The television pictures are scheduled to be transmitted live to earth. The Materials Experiment Assembly (MEA) is a desk-sized, self-contained package designed to accommodate a range of materials processing experiments. It provides subsystems to record experiment data and provide thermal control, power distribution and structural support for the experiments. The top of the rectangular package is a passive thermal radiator attached by a hinge to allow access to the experiments and subsystems. 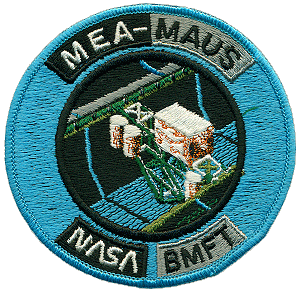 The primary objective of this flight is to verify the MEA flight hardware for future space operations. Obtaining qualitative and quantitative science data is the secondary objective. 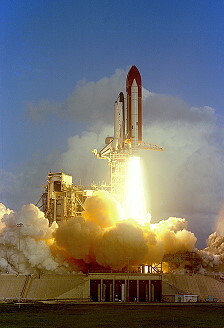 MEA-1 - Vapor growth of alloy-type semiconductor crystals  This experiment is to grow single crystals of alloy semiconductors by the chemical vapor transport technique in the microgravity environment of space. Germanium selenide is placed in a sealed gas tube. Both ends of the tube are heated at different temperatures. In a process similar to fog condensing to form ice crystals on a cold day, the substance turns to vapor when heated and moves to the cooler end of the tube where it crystallizes  thus vapor transport. It is concerned with the continued investigation of basic vapor transport and crystal growth properties of electronic materials. Practical benefits and applications that could result from this type of research include improved semiconductor technology for the electronics industry. MEA-2  Liquid phase miscibility gap materials  Some alloys have a temperature region within their cooling curve where the two molten metallic components of different densities do not mix and tend to separate on Earth, like oil and water. Even though the liquids mix initially, over a period of time they separate due to gravity, convection, and other influences. 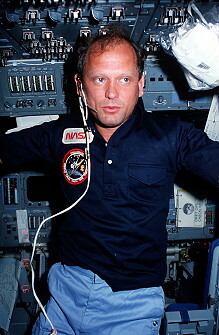 In space, however, two liquid metals can be heated, mixed, and cooled down to produce a new solid metal alloy containing the qualities of both materials. This temperature region is known as the miscibility gap, and the alloys formed out of these miscibility gap systems generally show large-scale inhomogeneities. This experiment investigates the physics of the alloy-forming process, using miscibility gap systems to determine if the reduction of component separation will significantly change the structure. Among the potential benefits of this experimentation are understanding the structural, electrical, and magnetic properties of materials. 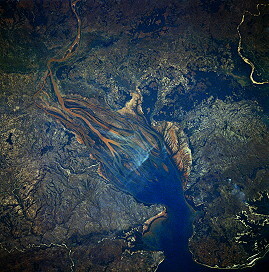 This experiment will use the remaining G-GPRF and all three cavities of the I-GPRF. The I-GPRF provides three mutually independent cavities for melting and resolidification of experiments. 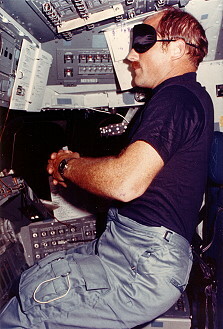 The isothermal temperature environment is maintained by the MEA computer programmed control of a single heating element in the cavity and a gaseous helium cooling medium. 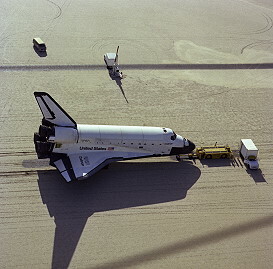 Specimen temperatures will be measured with thermocouples installed in each experiment cartridge during processing and will be recorded by the Data Management System (DMS) for post-flight use. This experiment will use 25 hours of processing time. MEA-3  Containerless processing of glass-forming melts  The primary purpose of this experiment is an evaluation of the SAAL furnace. The secondary purpose includes a determination of the raw materials preparation and melting procedures required to achieve chemically homogenous viscous melts and a comparative property analysis of glasses processed on Earth and in space. Possible applications of this experiment include improvements in glass technology. The experiment will use the one-dimensional levitator furnace with automatic sample exchange for eight samples. Sound wave pressure is used to suspend sample materials free of any container that could contaminate the sample, allow the sample to melt, then cooled and collected. The high-temperature furnace cavity is heated by a silicon carbide heating element. Cooling is accomplished by positioning a metal cooling shroud around the sample. The sound beam is projected through a port in one wall of the furnace and the specimen is injected through a port in the opposite wall. A quartz window alloys primary data recording of melting and cooling behavior of the glass samples via a 16mm motion picture camera. Upon activation during the flight, the system will operate automatically by the preprogrammed levitator microprocessor control, which is activated by the MEA Data Management System (DMS). 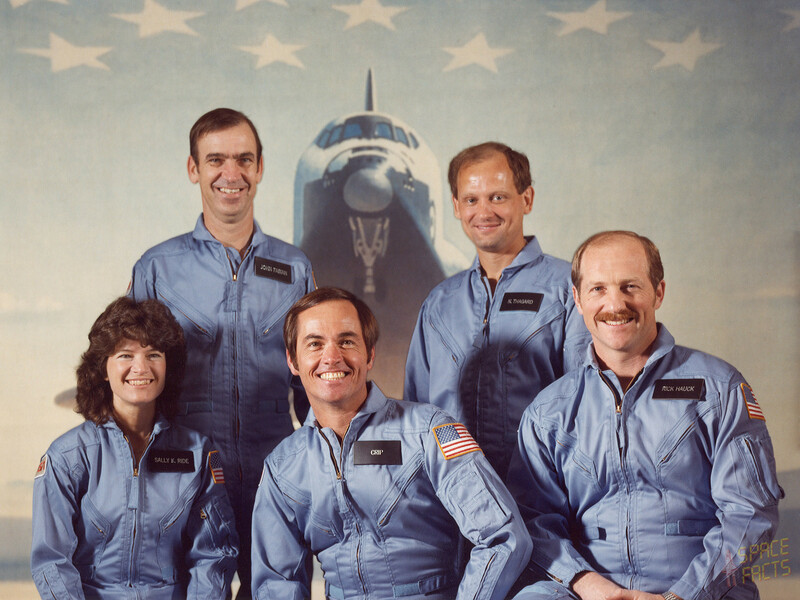 This mission also carried seven GAS canisters which contained a wide variety of experiments, as well as the OSTA-2 payload, a joint U.S.-West German scientific pallet payload. Among these experiments was an experiment with ants. Electrophoresis experiments and Monodisperse Latex Reactor (MLR) experiments were also performed. Materialwissenschaftliche Autonome Experimente unter Schwerelosigkeit (MAUS) consists of experiments contained in three "Getaway Special" (GAS) canisters. Each cylindrical canister carries an experiment furnace, which is thermally insulated and has its own service module containing experiment hardware, electrical power, experiment controls, data gathering and processing equipment, and general housekeeping sensors. 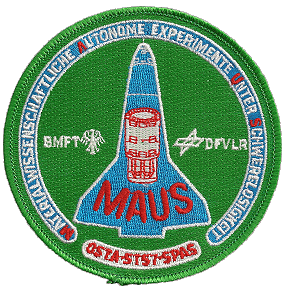 The Materialwissenschaftliche Autonome Experimente unter Schwerelosigkeit (MAUS, meaning autonomous materials science experiments under microgravity  by the way Maus being the German word for mouse, same pronunciation) sponsored by the German Federal Ministry for Research and Technology (BMFT) utilize Getaway Special GAS type systems with their own internal batteries and microprocessors. 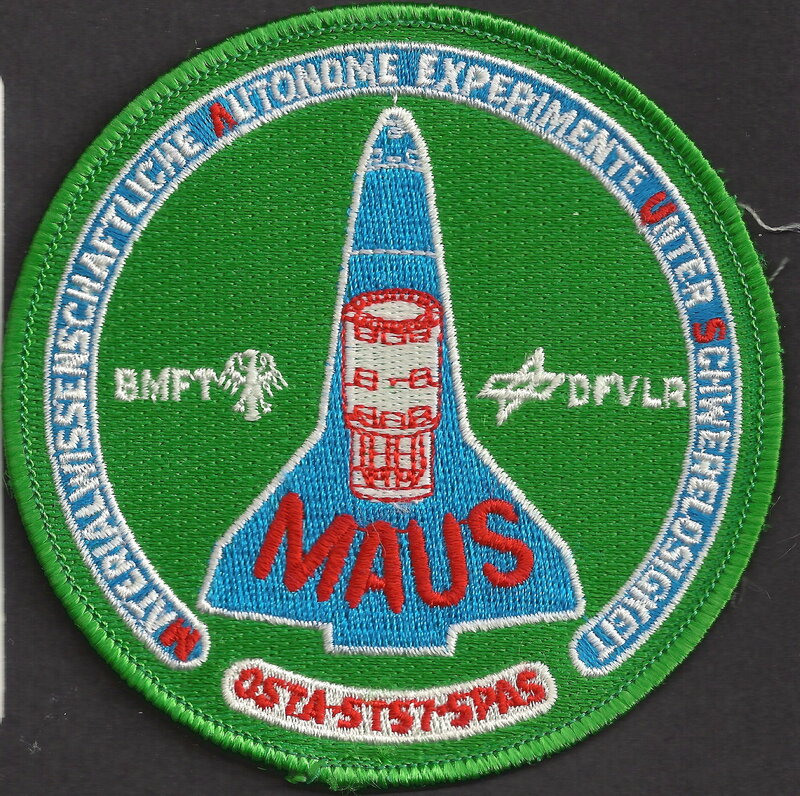 MAUS 1 will test microgravity processing of a new permanent magnet alloy using the properties of two metals (bismuth and manganese) that are difficult to mix on Earth. 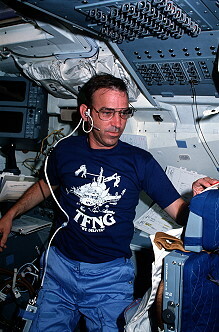 MAUS 2 will measure oscillatory Marangoni convection in fusion processes under microgravity conditions, a basic experiment concerned with crystal growing in space. 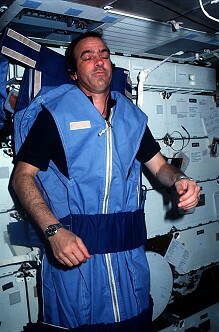 These two experiments will be conducted when SPAS-01 is deployed from Challenger, because otherwise the orbiters mass and stabilization movements will provide gravity that could affect the findings. MOMS, the Modular Optoelectronic Multispectral Scanner sponsored by BMFT, is an electronic remote sensing camera. 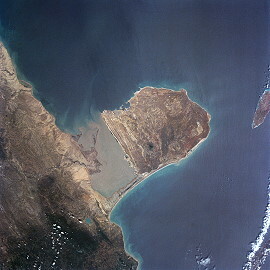 It was developed by MBB as a candidate for the European remote sensing program. Since the camera operating time is limited and the imaging will not penetrate cloud cover, scientists will use images from the Meteosat geostationary weather satellite as a real-time indicator to determine when the SPAS-based camera should operate. 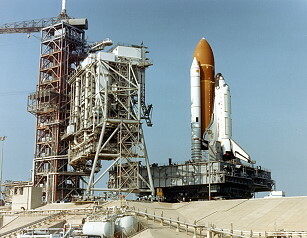 STS-7 was scheduled to make the first Shuttle landing at the Kennedy Space Center's Shuttle Landing Facility, but bad weather conditions forced a change again to Edwards AFB. Last update on December 31, 2018.